Decorate a Gingerbread House and make a little Magic! and make a little Magic! Decorating a gingerbread house is magical... the smell... the taste... the creativity and freedom you feel while building your own, colorful dream home! There's nothing like it for getting "visions of sugar-plums" dancing around in your head! 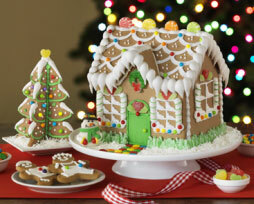 Building and decorating a gingerbread house is a wonderful tradition for kids to grow up with. Best of all, it let's us adults rekindle that magic for a little while! In case you haven't guessed it yet, this site is all about Gingerbread. We'll share our favorite recipes, tips for making icing and decorating, kits, patterns and plans, candy suggestions, and lots and lots of photos for inspiration! From ornate and intricate to a model of simplicity to down-right strange, you'll find something to inspire you and help you come up with your own decorating ideas. We've built and decorated our own gingerbread creations, of course, AND we've visited many contests to bring you the best of the best (and the strangest of the strange!) Best of all, other visitors to this site have shared hundreds of photos and stories of their own, making it truly a community effort! Did you ever think you'd be part of a gingerbread community?? Well, you are now! We offer for sale our own gingerbread house patterns as well as several terrific free templates. 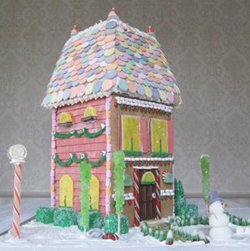 There's a castle, a traditional Victorian gingerbread house, a bungalow, a beach house, and lots more gingerbread patterns. There's a place to request a particular pattern or vote on other people's suggestions, and we can even build you your own custom-designed template if you wish! Here are a few of our gingerbread house patterns. Click on any of them to go to our templates page to buy. 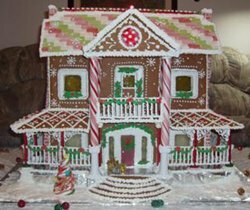 Click here to view our testimonials and see the beautiful houses our customers have built with our gingerbread patterns. Fondant and Gum Paste and Marzipan... Oh my! 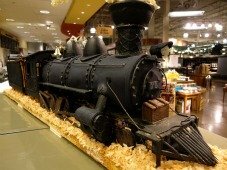 Since the decorating techniques are virtually the same, our site has grown to include more and more cookie and cake decorating ideas and tips as well. 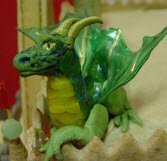 We share recipes and tips for working with fondant, marzipan, gum paste, pastillage, pulled sugar, sugar paste, and molded chocolate. 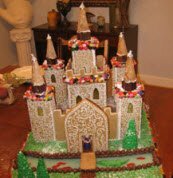 Visitors have contributed their own cake decorating pictures, tips, comments, and ideas. And not just photos of cake decorating patterns but all kinds of clever creations made out of edible clays. There's even a lively section where visitors ask (and answer) questions about decorating techniques. 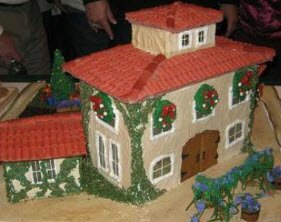 Our pages on fondant, gum paste, marzipan,... can help you learn which sugar craft "clay" to use for each kind of decorating. You'll get recipes and learn skills that you can use for cake decorating as well as gingerbread! Gingerbread makes terrific edible Christmas gifts of course! From gingerbread house kits to personalized, decorated gingerbread houses, your friends and family will LOVE getting gifts this year that don't clutter up their house! But edible gifts are not only perfect for the holidays. Gingerbread (homemade or purchased) can be added to fruit baskets and other edible gourmet gifts any time of year. 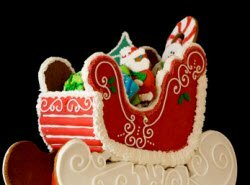 Get inspired by our edible gifts pages. Gingerbread isn't just for Christmas anymore. Of course we have loads of Christmas gingerbread and other holiday ideas, from easy kids Christmas cookies recipes to how to decorate christmas cookies like a pro. But we also share plans and patterns for lots of non-holiday edible decorating ideas, as well as ginger recipes and even how to grow your own ginger. Want the fun, but not the work? 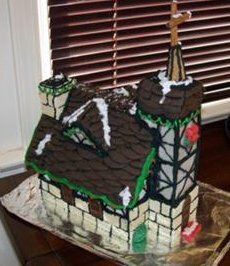 Anyone who's built a gingerbread house from scratch knows that it can take quite a bit of effort (even an entire weekend sometimes!) to get the house ready for decorating. Whether you want the full experience of house creation or just want to do the "fun part" - only decorating - we'll share all the ideas and experience YOU need to make sure you have FUN and not frustration along the way! Look around these pages and try out some of our many patterns, recipes and decorating ideas. Then, share photos and comments about your OWN edible projects. With this site, we hope you'll find yourself in Gingerbread Heaven! Have questions about how to create perfect see-through windows, how long gingerbread lasts, how to make curved gingerbread, or how to keep gingerbread walls from sagging over time? These (and more) questions have probably already been asked (and answered) on one of our gingerbread questions pages. Make sure to answer a question or two when you ask one to pay it forward!